To cite: Amit Gupta. 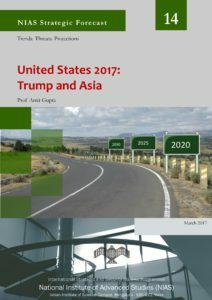 “United States 2017: Trump and Asia,” NIAS Strategic Forecast No. 14. Bangalore: International Strategic and Security Studies Programme, National Institute of Advanced Studies, March 2017. On the campaign trail Donald Trump made a series of provocative statements about dealing with China and the broader Asian region. He suggested that his administration could impose 45% tariffs on China, accused Beijing of currency manipulation, and swore to withdraw the United States from the Trans Pacific Partnership. After being elected, President Trump took a congratulatory call from the President of Taiwan and even questioned the rationality of the United States’ decades long one-China policy. Added to these proclamations was the insistence that a Trump Administration would not tolerate a nuclear and aggressive North Korea. Where is the Trump Administration likely to go in its dealings with Asia? About the Author: Amit Gupta is a Professor at the US Air War College, Alabama, US.